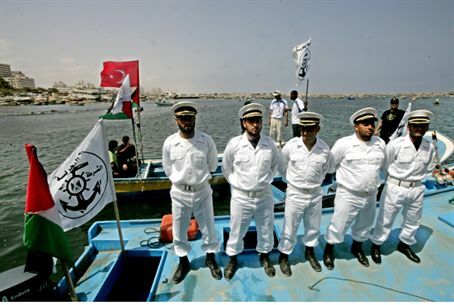 PA Calls for international protection for Finnish flotilla, setting sail for Gaza from Italy. On Sunday, the Palestinian Authority (PA) called for international forces to protect a boat carrying pro-PA activists trying to break Israel's naval blockade on Gaza. Hamas has urged the world to respond to the Finish-flagged boat, Estelle, by pressuring Israel to end its blockade on Gaza, Xinhua has reported. The boat set sail from Naples, Italy, on October 7, carrying more than a dozen activists bearing “humanitarian aid”, most of them from Western countries. Meanwhile, the Israel foreign ministry Saturday notified Finland that the boat will be stopped if it tried to enter Gaza's waters. The yacht, which was built in 1922, carries 16 people, mainly from Western countries but also one Israeli national, as well as humanitarian aid, AFP reported. Depending on weather conditions, it is expected to reach Gaza in around two weeks. Canada's Gaza's Ark group, which supports the mission, said on its website the Finnish ministry had informed it of the Israeli warning. Yousef Rizka, a Hamas official, warned that Israel might be willing to use "violence and terror to prevent the humanitarian aid from reaching Gaza". He said the international community must "stop the Israeli aggressive actions". It has been proven conclusively that Gaza is not in need of humanitarian aid, but needs fair distribution of financial resources.There are abundant luxury hotels, shops and spas,teeming markets and thriving smuggling operations, but the rich ignore the plight of the poor.